Former Princpal Artist Kirsty Martin is returning to the stage as Hanna Glawari in our Sydney and Melbourne seasons of The Merry Widow. Jane Albert caught up with her to talk about feeling her way back into the character - and her pointe shoes. Why did you decide to return to the stage? [Artistic Director] David McAllister and I were talking casually at a dress rehearsal last June and I said I’d love to come back and do an acting role. He jokingly mentioned The Merry Widow and we laughed about it. I said: “Yeah, no, that’s en pointe, that requires serious return.” Then I couldn’t stop thinking about it. When you leave the stage you miss it, not so much the performing but the feeling of movement, being creative and interpreting a role. The artistic side is something I’ve always loved. So I went back to David and said it was actually something I’d really like to do, if he was serious? He said great, he thought it could work. What has it been like getting performance-ready? It’s been quite a slow process getting my body back into shape, which is how I wanted to do it ­– as slow and sensibly as I could. I’ve been doing lots of Pilates and conditioning work with the company, it’s something I’ve always done, and I don’t think I could come back and dance at this age ­– I’m 42 this year – if I hadn’t been doing that. When you’re a mum you tend to neglect yourself, so it’s been busy but I’ve been really enjoying indulging in looking after myself. My body is in a great place, now it’s about getting my head around getting on stage again, and getting into the character. I’m retired, so I’m not going to be coming back the Kirsty Martin I was before. Being a teacher and a mum and keeping up the discipline and consistency to keep the momentum going has been intense but I feel ready now. Or as ready as I’ll ever be, anyway! How hard has it been to get back into pointe shoes? The pointe work is probably the hardest element. When you’ve been a dancer your whole life you get so used to being in pointe shoes, they’re like your slippers. I’ve realised how much strength you develop in your feet but also your whole body. It changes the way you feel, changes the way you walk, the way you stand. So it’s getting used to having that feeling again. I’ve been trying to have them on as much as possible; I walk around the house in them. Class is one thing, building up that strength, but it’s also building up to being comfortable in pointe shoes again, getting from one side of the stage to the other without feeling like you have bricks on your feet! 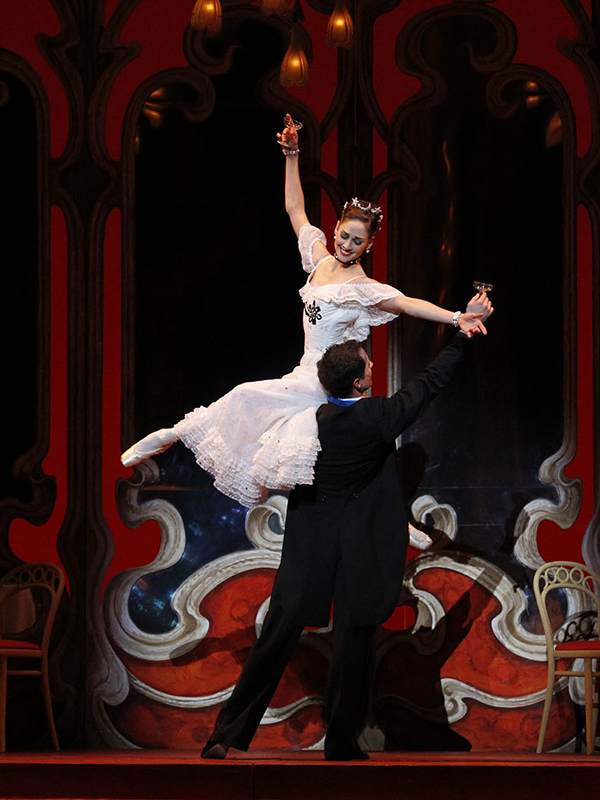 Can you tell us the story of The Merry Widow? Hanna Glawari is a powerful, wealthy and beautiful Pontevedrian widow who inherited a huge fortune from her late husband. The state is bankrupt so the embassy holds a ball to try to find a suitor for Hanna to marry, so they can keep the money in the state. The man they have in mind, Count Danilo, happens to be a man she was in love with when they were younger and she was just a poor country girl, and he ditched her. The ballet is about them reacquainting and playing games – “You didn’t want me then so you’re not going to get me now”. This is my third time doing this ballet. The first time I was very young, in my early 20s; the second was when I was retiring in 2011. Hanna is very confident and powerful, she’s a grown-up and has been through a lot. Returning to it now, being older myself, I feel I’m reinventing her – I feel different, so I’m developing a new character. Every time you dance with someone else it’s a different experience. My first partner was Joshua Consandine. We danced together a lot and that was special because it was at a point in my career when I was being given lots of opportunities, doing the odd principal role. In 2011 I danced it with Robert Curran: he’s a fantastic, strong partner and it was great having that security behind me – it allowed me to luxuriate in the movement. It’s such an interesting experience dancing with a partner because you have to connect, it’s not just the boy carrying you around, you have to really work together for the story to come out. This time I’m dancing with Adam Bull. We’ve danced together in the past and it will be different again with him. Our first performance we’ll probably still be exploring what we have with each other but that’s OK. Because we’re more mature dancers you let that happen, you trust that we’re artists and can feel it along the way. I have all my trust in Adam, he’s a fantastic partner. You retrained as a teacher and now teach at The Australian Ballet School. What is it like returning to the company as a dancer? More than half the company are new to me – I was out of the ballet world altogether for a few years there, I stepped away and was a housewife. It’s been lovely getting to know the dancers, a lot of them didn’t know who I was either. And it’s so interesting to see some of the students I used to teach who are now in the company. It’s a strange experience to step into class and stand alongside them at the barre, but really lovely as well to see them in the professional world. Will your children come and watch you? Absolutely. Oscar remembers me dancing, he watched my last show and saw [Kirsty’s husband and former principal artist Damien Welch] and me dance quite a lot. Matilda doesn’t remember me dancing at all because she was two when I retired. Now I’m going on stage she thinks I might be a bit more special than she thought!